CP Automation has formed a new joint venture project with Swedish active filter manufacturer Comsys AB, a technology leader in power quality solutions. The new venture allows CP Automation to act as a complete one stop for both passive and active harmonic solutions. Comsys AB’s products eliminate operational disturbances and promote efficient energy usage. The business is built around onsite measurements, power quality analysis and solutions based on ADF active filter core technology to optimise electrical equipment operation and minimise disturbances. Comsys provides ADF for OEM use, helping manufacturers of industrial equipment to cut power consumption and guarantee their customers that the products will not disturb nearby equipment, complying with set standards like IEEE519, G5/4 and EN61000-2-2. Conventional techniques for dealing with power quality problems use fixed filter banks configured to match a specific installation. At best these solutions only compensate for 60-80% of the losses due to their relatively slow response times. With the introduction of active conditioners, such as ADF, response times are brought down to microseconds. “CP Automation is a well established partner in the automation and drives, sector, primarily in the UK but also internationally,” said Rickard Jacobson, account manager at Comsys AB. “Our biggest market today is the provision of frequency converters to handle the problems that variable frequency drives create. This means that a player that is active and doing a good job of serving both manufacturers and systems integrators is a good match for our company. “For the customer, benefits of working with our partnership include a reduction in production downtime, reduced overheating in attached equipment and energy savings from decreased electrical losses. “Comsys is going to supply seven ADF P300 units for the new MAX IV science lab in Lund, Sweden. The installation is under construction and, when complete, it will be one of the most advanced facilities in the world, rivalling CERN for investigating new materials by using beamlines,” concluded Jacobson. 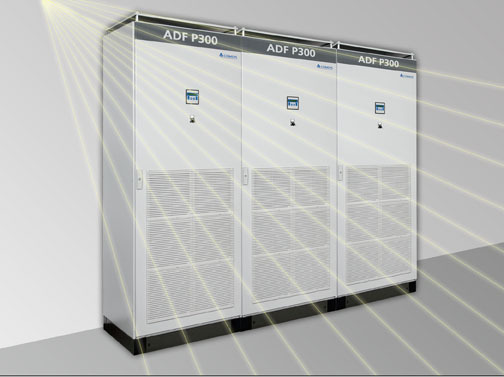 The ADF P300 is an advanced, computer-controlled current generator connected in parallel with the load requiring compensation. The flow of electrical current between the load and the network is measured and analysed to determine losses such as reactive displacement and/or the presence of harmonics. Whenever necessary, ADF injects opposite phase current to cancel out harmonics and/or reactive displacement, correcting electrical behaviour. The resulting energy profile appears ideal to the rest of the grid network. ADF functionality is achieved by using state-of-the-art signal processing and advanced control structures to direct the power flow to and from the machine. Energy can be temporarily stored in the ADF making it possible to also deliver energy back to the grid.